Skittles 7:30pm. The last official social evening of the winter .. come and have nibbles and fun. Signing-on night 7:30-9pm. Come and pay your fee and make some decisions about competitions and leagues. Come and help tidy up the green from 10am. Members’ Opening Day from 10am. Get ready for a good summer of bowling! 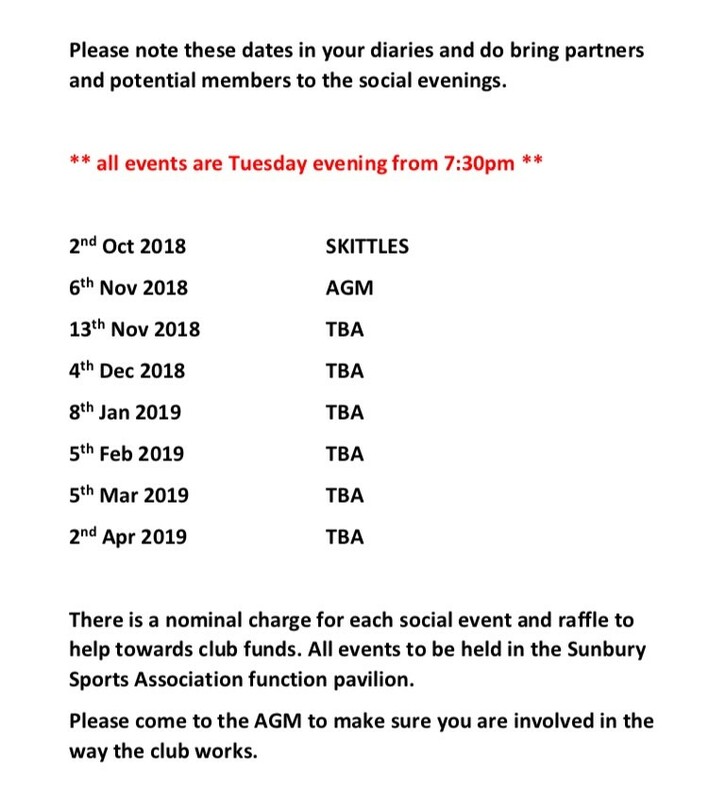 The first social event of 2019 is an evening of Skittles on Tues 8th January 7:30pm. All are welcome. Mark and Chris have prepared a quiz with a difference so do come along and try the updated format. An evening of games is in store – there’ll be something for everyone! Put your bowling skills to the test on a smaller scale! NB: All events start 7:30pm and there is a nominal charge for entry and a raffle to help towards club funds. Saturday 15th September Beer and Gin Festival at Sunbury Cricket Club. 12 noon till midnight. Tuesday 18th September – no organised roll-up but do come and practice if you want. Saturday 22nd September – Mavis Steele Cup day. Please put your name down for this women vs men event in memory of Mavis who was an international player at Sunbury. Tuesday 25th September 10am – Hedge Cutting and clearing up. Please help if you can. Saturday 29th September – The firm we pay to do the autumn work on the green will be working from 1.30pm and it is worth coming to see how it is done. Sunday 30th September 10am – Clearing for the winter inside and out. Again, please help if you can. Tuesday 2nd October 7.30 – come for Skittles in the clubhouse. Saturday 6th October – Make sure your name is down for this party at Tony and Janet’s house if you can. Tuesday 30th October – Last day for entries to Middlesex Bowls Competitions . Please talk to David Chatterton for men and Cassie Chatterton for ladies beforehand. Tuesday 6th November – AGM at 8pm. After the formal business the meeting can discuss anything relevant to our club. No votes are taken but matters noted for the committee to consider. Friday 23rd November from 12 mid-day. Make sure you have booked your tickets and chosen your menu. Tuesday 4th December – A social evening which may be a quiz, skittles or another exciting occasion. The final bowls event of the 2018 season is on Sat 22Sept 2:30pm. Please sign-up for the challenge .. it’s Men vs Women! 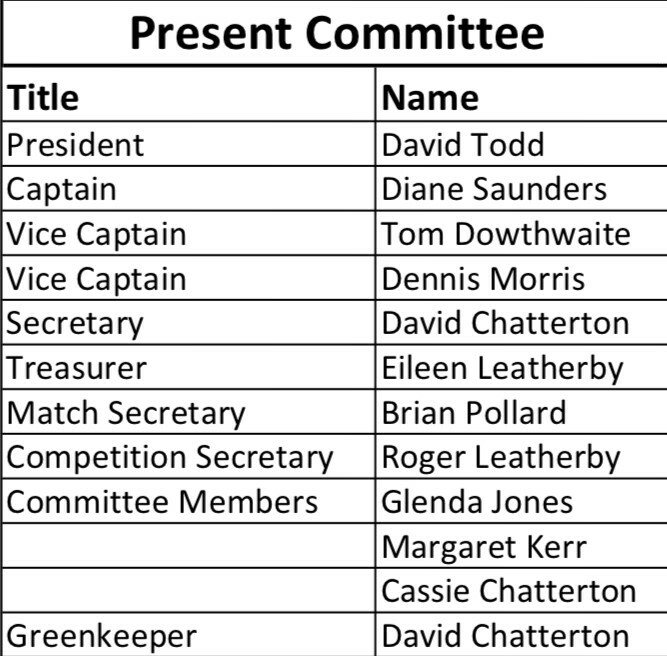 Please do propose and second committee members for the 2018 AGM. The list is available in the Men’s changing room.